When everyone is keeping secrets, it’s impossible to know who to trust. To put her life back in perspective, Kara Galway has moved home to Texas after years in New England. The up-and- coming defense attorney intends to concentrate on her career and spend time with her Texas Ranger brother. But fate has something else in store. While Kara is devastated to learn her former mentor, Connecticut governor Mike Parisi, has died suddenly, she’s pleased for her best friend, Allyson Stockwell, the new governor. Then Allyson’s children show up at Kara’s Texas home. They are terrified—and hiding something. Afraid for themselves and their mother, they are certain the circumstances of Mike’s death are suspicious. 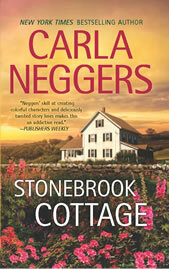 Kara must return with the children to Allyson’s home, Stonebrook Cottage, to unravel what exactly is going on. Are the children really in danger? What secret is Allyson hiding? And then there’s Sam Temple, the Texas Ranger Kara has fallen head over heels in love with. Sam has followed her to Connecticut and has no intention of leaving without her. Kara must uncover the truth if she is going to protect the people she loves.